(Newser) – Rising tensions in Benghazi didn't seem to worry US officials, who left the American mission there poorly guarded before the assault that killed Ambassador Chris Stevens and three others, the Washington Post reports. In fact, the State Department hired a small British firm to guard the compound for $387,413—a pittance in the world of war-zone contracts. Yet a series of fundamentalist attacks in eastern Libya this summer clearly signaled a threat to Westerners, and a Libyan official had warned the US to keep a low profile. Most of the questions, it seems to me, have already been answered. Stevens was considered a good friend and major ally by the Libyan people. He was very well liked, and, as the article said, considered Benghazi as "home." The ambassador makes the decisions about the security for the missions and early on we were told that Stevens was trying to present a friendly and trusting face to his Libyan friends. It's interesting, in all the screaming about government overspending, that the economizing here by spending only a third of a million dollars on hiring security is now a target. Hindsight is truly clear. So, an ambassador who was considered a true friend and strong ally, in presenting a trusting and friendly face to the people who considered him a friend and ally even though he knew he was in danger, while traveling to an outlying mission with a security force he chose, was attacked by insurgent militants trying to establish a power base in the region using weapons common across the nation in the wake of the recent revolt that overthrew a dictator. All this information has been available in various places. All you have to do is put it together and the mystery is dramatically diminished. this thing stinks like a ton of dead libyan scum! Why do they attacked and killed the Ambassador and two others, destroyed the embassy if they just don't hate Americans? Why did the US Government let the military guards go when the government of Libya is still in transitions from rebellion? 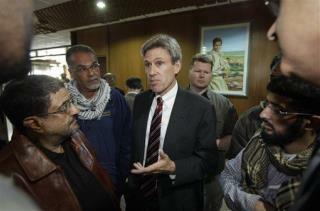 Why did the State Department did not relocate the US Embassy in Tripoli, a central location for Intelligence/security.